In attempting to keep Ruthie from one show, her grandmother provides her with another. But of course what caught my attention was the Hennediella stanfordensis in Cornwall. Soil, among grasses, drainage ditches, fields; low to moderate elevations (100-300 m); Calif.; Mexico (Guerrero); Europe; Australia. 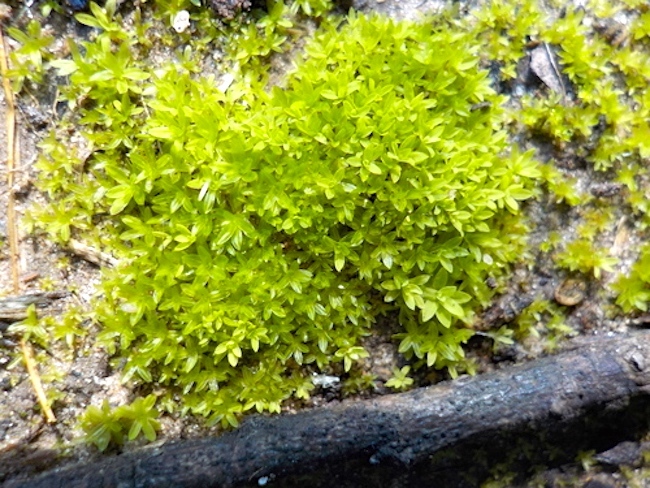 The Pottiaceae are a family of mosses. They form the most numerous moss family known, containing nearly 1500 species or more than 10% of the 10,000 to 15,000 moss species known. Mosses are small flowerless plants [in the division Bryophyta] that typically grow in dense green clumps or mats, often in damp or shady locations. The individual plants are usually composed of simple leaves that are generally only one cell thick, attached to a stem that may be branched or unbranched and has only a limited role in conducting water and nutrients. Although some species have conducting tissues, these are generally poorly developed and structurally different from similar tissue found in vascular plants. Mosses do not have seeds and after fertilisation develop sporophytes with unbranched stalks topped with single capsules containing spores. … Moss is often considered a weed in grass lawns, but is deliberately encouraged to grow under aesthetic principles exemplified by Japanese gardening. 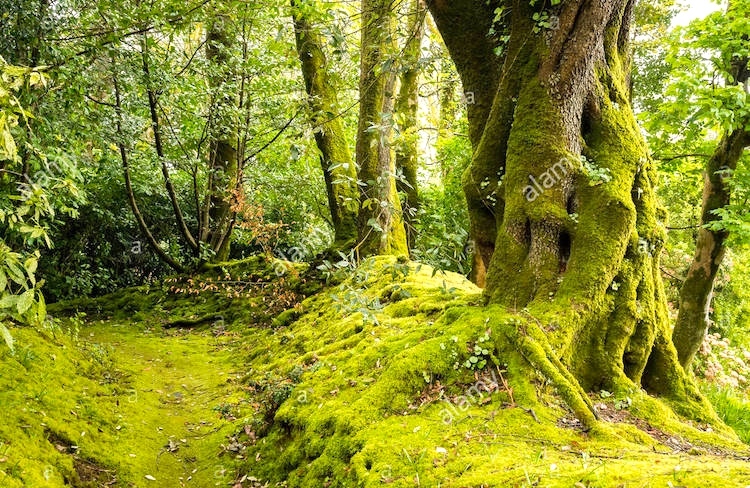 In old temple gardens, moss can carpet a forest scene. Moss is thought to add a sense of calm, age, and stillness to a garden scene. Moss is also used in bonsai to cover the soil and enhance the impression of age. … In the cool cloudy damp Pacific Northwest, moss is sometimes allowed to grow naturally as a lawn substitute, one that needs little or no mowing, fertilizing or watering. In this case, grass is considered to be the weed. Landscapers in the Seattle area sometimes collect boulders and downed logs growing mosses for installation in gardens and landscapes. Woodland gardens in many parts of the world can include a carpet of natural mosses. 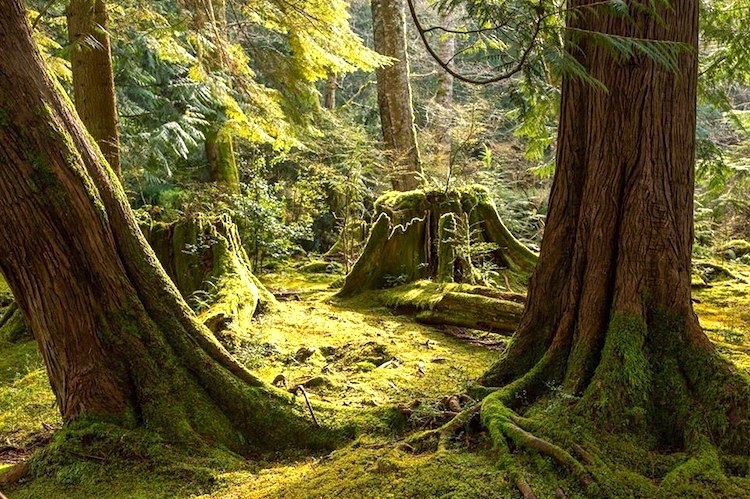 The Bloedel Reserve on Bainbridge Island, Washington State, is famous for its moss garden. The moss garden was created by removing shrubby underbrush and herbaceous groundcovers, thinning trees, and allowing mosses to fill in naturally. … A passing fad for moss-collecting in the late 19th century led to the establishment of mosseries in many British and American gardens. The mossery is typically constructed out of slatted wood, with a flat roof, open to the north side (maintaining shade). Samples of moss were installed in the cracks between wood slats. The whole mossery would then be regularly moistened to maintain growth. 1872 Overland Monthly July 86 Only small, sunless nooks were kept for mosseries and ferneries. 1895 Scotsman 25 Oct. 6/6 Visiting the Botanic Gardens in Glasgow the other day, I observed in the ‘mossery’..a peculiar-looking selaginella. A fern is a member of a group of vascular plants that reproduce via spores and have neither seeds nor flowers. They differ from mosses by being vascular, i.e., having specialized tissues that conduct water and nutrients, in having branched stems and in having life cycles in which the sporophyte is the dominant phase. Like other vascular plants, ferns have complex leaves called megaphylls, that are more complex than the microphylls of clubmosses. Most ferns are leptosporangiate ferns, sometimes referred to as true ferns. They produce coiled fiddleheads that uncoil and expand into fronds. The group includes about 10,560 known extant species. I have lots of reference works on plants, but they’re almost all about garden flowers or wildflowers, so they don’t cover mosses and have only a bit to say about ferns. 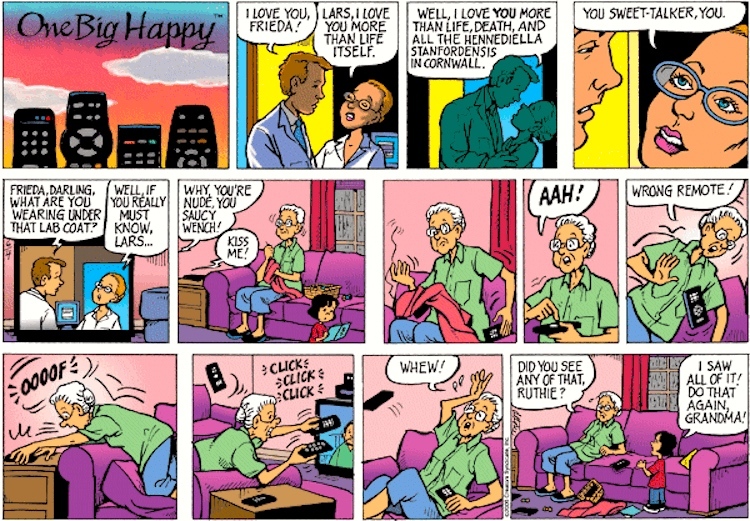 This entry was posted on July 1, 2018 at 9:36 am and is filed under Language and plants, Linguistics in the comics, Understanding comics. You can follow any responses to this entry through the RSS 2.0 feed. You can leave a response, or trackback from your own site.